Marley braids have been so a la mode this year. Women all over youtube have uploaded videos on how to get Marley braids using 100% Kanekalon hair. But is this kind of hair really protecting your natural hair, or destroying it? Because synthetic hair is made of artificial materials, it has a plastic feel to it. It does not feel like natural hair. Kanekalon, monofilament, polypropelene and toyokalon are specific types of synthetic hair, but Kanekalon is considered a higher quality hair, according to doctored locks. The number one problem with Kanekalon hair is that it is like petroleum; It blocks the oil when trying to moisturize your hair. And what happens when your hair does not get moisturized? The hair becomes dry and brittle and you end up having bits and pieces of hair all over your shoulders when you take the braids out. Problem number two is the heaviness . Braiding your hair with synthetic hair can actually pulls your own natural hair from your scalp. You don’t believe me! Try putting your hair into a ponytail right after you get your braids. For somebody with a sensitive scalp, even letting the braids down can put stress on your scalp. Some women even reported being allergic to this type of hair. Finally, not being properly cared for. Some women think that once their hair is braided, their ends are protected. They can go weeks without touching their hair. If the natural oil produced by your body cannot travel all the way to your ends, you have a problem. Naturals with 4c hair type like me cannot afford not to care for our hair when is is braided with any kind of hair, human or otherwise. So how do you make sure that your protective style actually protects your hair? Oil your scalp every other day. Moisturize your braids all the way to your ends with a water based ( light, not creamy) moisturizer like S-curl “No Drip” Activator Moisturizer. You need a moisturizer that can easily penetrate the synthetic hair. Seal in the moisture with an oil like you would if your hair were not braided. Wash your hair at least every 3-4 weeks with a clarifying shampoo to avoid product buildups. Synthetic hair does not like to be rubbed, so massage your scalp, and avoid using your fingernails. Moisturize and seal your braids to lock in the moisture. Air dry your hair at least 90% before using a hair dryer. Wrap your hair with a satin scarf/bonnet before going to bed to retain moisture. Kanekalon hair is a great alternative to 100% human hair, but it can damage your hair if not cared for properly. 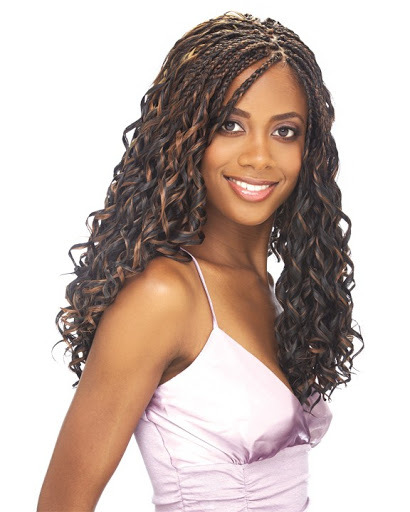 Even if your hair is braided that does not mean you should stop your regular routine or regimen. Protective styles are great ways to give your hair a break from excessive styling and other manipulations, but taking care or your braids is the only way to ensure that your hair is really being protected.